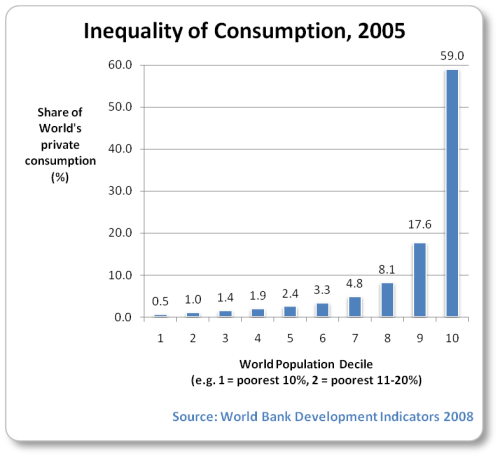 Almost half the world ” over three billion people ” live on less than $2.50 a day. 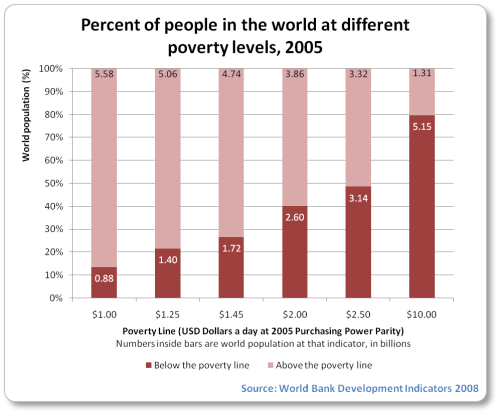 More than 80 percent of the world™s population lives in countries where income differentials are widening. Around 27-28 percent of all children in developing countries are estimated to be underweight or stunted. The two regions that account for the bulk of the deficit are South Asia and sub-Saharan Africa.If current trends continue, the Millennium Development Goals target of halving the proportion of underweight children will be missed by 30 million children, largely because of slow progress in Southern Asia and sub-Saharan Africa. Based on enrollment data, about 72 million children of primary school age in the developing world were not in school in 2005; 57 per cent of them were girls. And these are regarded as optimistic numbers. Infectious diseases continue to blight the lives of the poor across the world. An estimated 40 million people are living with HIV/AIDS, with 3 million deaths in 2004. Every year there are 350-500 million cases of malaria, with 1 million fatalities: Africa accounts for 90 percent of malarial deaths and African children account for over 80 percent of malaria victims worldwide. To these human costs can be added the massive economic waste associated with the water and sanitation deficit. The costs associated with health spending, productivity losses and labour diversions are greatest in some of the poorest countries. Sub-Saharan Africa loses about 5% of GDP, or some $28.4 billion annually, a figure that exceeds total aid flows and debt relief to the region in 2003. Rural areas account for three in every four people living on less than US$1 a day and a similar share of the world population suffering from malnutrition. However, urbanization is not synonymous with human progress. Urban slum growth is outpacing urban growth by a wide margin. Approximately half the world’s population now live in cities and towns. In 2005, one out of three urban dwellers (approximately 1 billion people) was living in slum conditions. In developing countries some 2.5 billion people are forced to rely on biomass fuel wood, charcoal and animal dung to meet their energy needs for cooking. In sub-Saharan Africa, over 80 percent of the population depends on traditional biomass for cooking, as do over half of the populations of India and China. Indoor air pollution resulting from the use of solid fuels [by poorer segments of society] is a major killer. It claims the lives of 1.5 million people each year, more than half of them below the age of five: that is 4000 deaths a day. To put this number in context, it exceeds total deaths from malaria and rivals the number of deaths from tuberculosis. The world’s billionaires just 497 people (approximately 0.000008% of the world’s population) were worth $3.5 trillion (over 7% of world GDP). 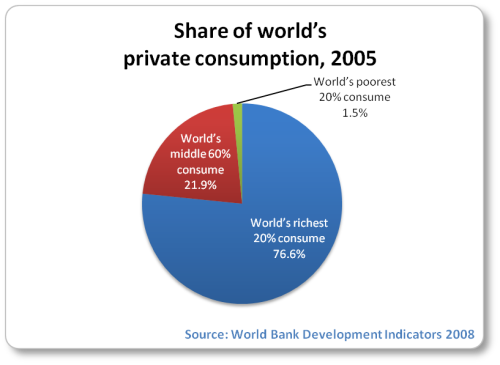 Middle income countries (3 billion people) made up the rest of GDP at just over $10 trillion (20.7%). The total wealth of the top 8.3 million people around the world rose 8.2 percent to $30.8 trillion in 2004, giving them control of nearly a quarter of the world’s financial assets.In other words, about 0.13% of the world’s population controlled 25% of the world’s financial assets in 2004. A conservative estimate for 2010 finds that at least a third of all private financial wealth, and nearly half of all offshore wealth, is now owned by world’s richest 91,000 people – just 0.001% of the world’s population.The next 51 percent of all wealth is owned by the next 8.4 million – just 0.14% of the world’s population. Almost all of it has managed to avoid all income and estate taxes, either by the countries where it has been invested and or where it comes from. In 1960, the 20% of the world’s people in the richest countries had 30 times the income of the poorest 20% – in 1997, 74 times as much. Education and literacy: Progress in education also slowed during the period of globalization.